Inky Paws Challenge: Inky Paws Challenge #6 Winners! Inky Paws #06 Challenge - WINNERS! We had so much fun checking out all the entries for our sixth Inky Paws Challenge at here at the Newton's Nook Designs blog! This time we switched things up and did a COLOR challenge - and all our participants really did a great job with it! As always- it's hard to pick a winner! Thanks to everyone who played along! It's always so much fun to see what everyone does with our stamps! We love seeing all the projects. This card by Christiana is our first winner this month! 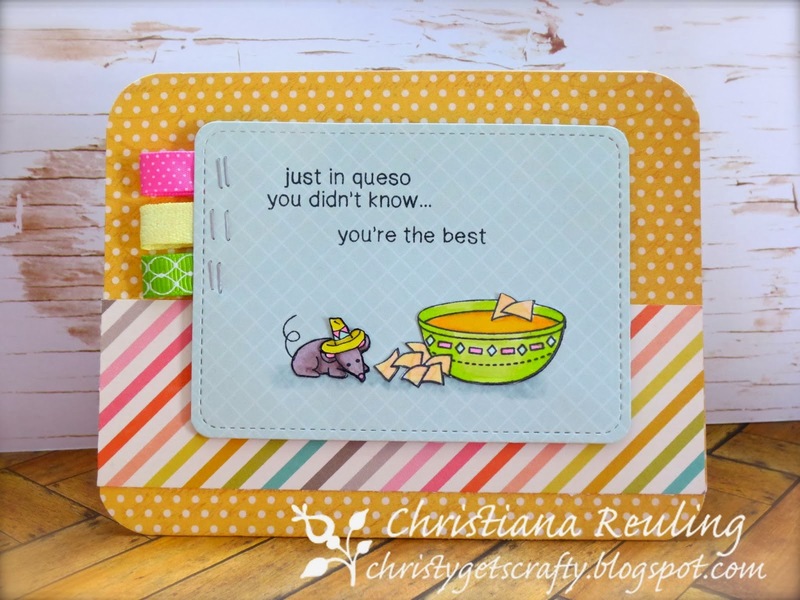 Christiana made this adorable card using our Just Say Cheese set and even hand-drew a sombrero for the mouse! ADORABLE! If you head over to her blog, Christy Gets Crafty, you can watch a video showing how she created her project too. 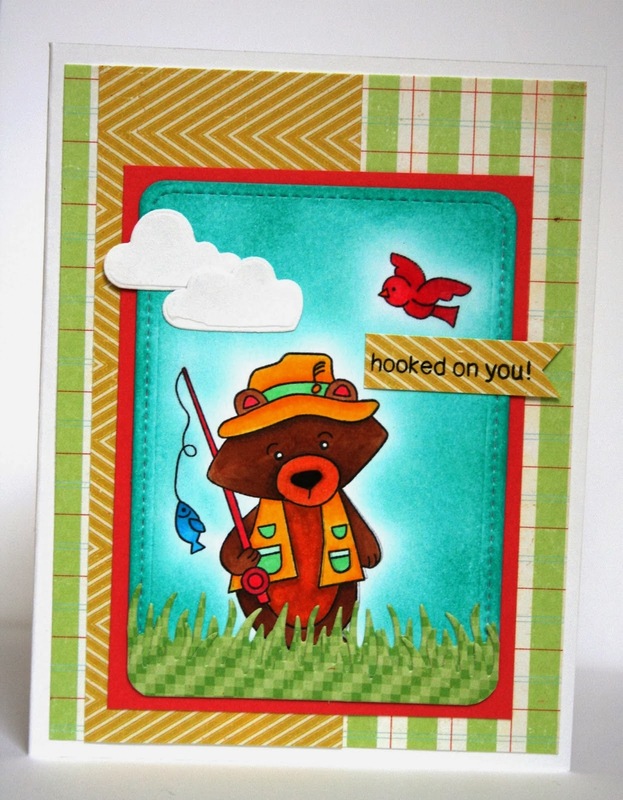 Our second winner is Jess with this fun card featuring the bear from our Campfire Tails set! We loved the bright colored sky and scene that she created! So pretty! Jess actually made another card with a night scene too- We thought this card fit the color challenge better but loved both. Make sure to check out her other card too over on her blog, Basic Jess. Congrats Jess and Christiana! Don't forget to send me an e-mail at info@newtonsnookdesigns.com to claim your $10 store credit and get your winner badge for your blog! This card by Tanja is so cute! Love the coloring on the kitty and the dot pattern. Plus, the woodgrain frame is so fun! Tanja used our our Newton's Antics set! We loved the fun layout on this card with the folded paper corner by Barbara! What a great idea for double-sided papers! Barbara used our Love à la Carte Set. This bright and colorful, Warhol inspired card by Jen also caught our eye! I love the simple, bright composition! 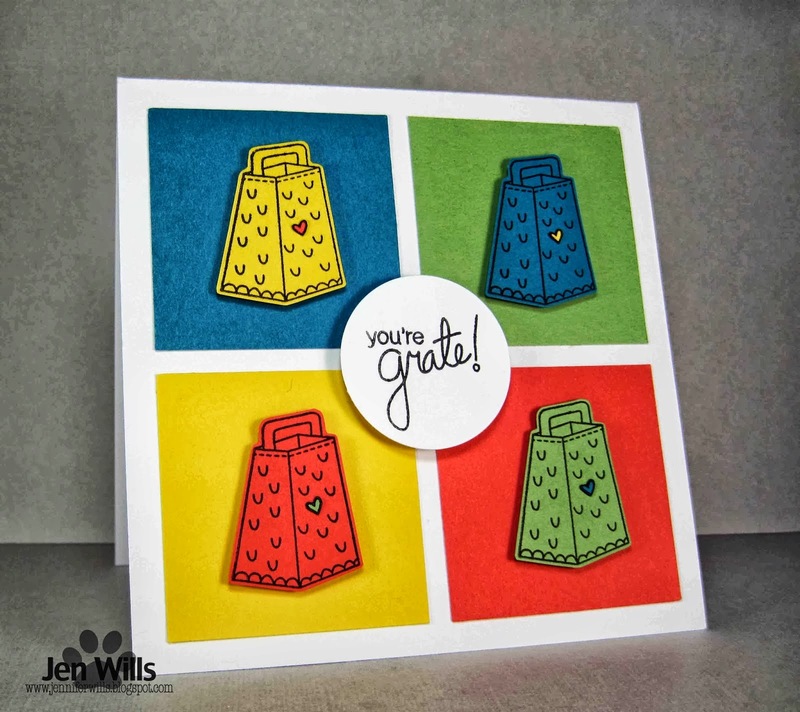 Jen used the cheese grater from our Just Say Cheese set.